Barnacle Press - Weblog, accompanied by an archive of classic comics, mostly dating from the turn of the (last) century through the 1930s. Cartoon Network - From Ben 10, Star Wars and Total Drama Action, to Adventure Time and more. Jamiol's World - Paul Jamiol. 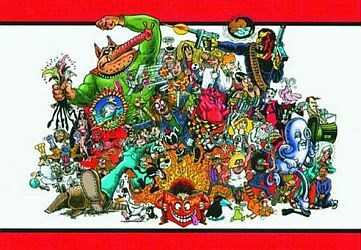 Lambiek.net and Lambiek Comiclopedia - Illustrated compendium of over 5,000 international comic artists with biographies and artwork examples. Library of Congress Cartoons and Comics - Represented in the collection is the entire range of comic-book subject matter: western, science fiction, detective, adventure, war, romance, horror, and humor. Although scattered issues date from the late 1930s, the holdings are most comprehensive from 1950 to the present. Action Comics, Archie, Detective Comics, Tarzan, and Wonder Woman are among those with fairly complete runs. Punch - Punch, magazine of humour and satire, ran from 1841-2002. A very British institution renowned internationally for its wit and irreverence, it introduced the term "Cartoon" as we know it today and published the works of great comic writers and poets such as W.M. Thackeray, Mayhew, P.G. Wodehouse, Sir John Betjeman, Alan Coren and Miles Kington amongst others. Its political and social cartoons swayed governments, capturing life in detail from the 19th and 20th centuries. The finest cartoonists appeared in Punch - legends like Tenniel, Du Maurier, Shepard, Pont, Illingworth, Fougasse, R.S. Sherriffs, Trog and Searle. Simpsons, The and here - Matt Groening, et al. Unquotable Trump, The - R. Sikoryak. This webpage last updated on Monday, January 21, 2019 12:04 PM.